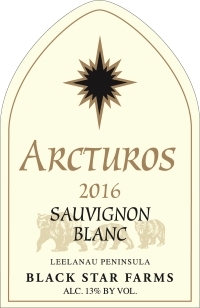 We are excited about the release of this popular dry white varietal that is perfect for summer drinking. This Sauvignon Blanc has crisp acidity with a bright finish and is a classic representation of a Michigan dry wine. Lemon and grapefruit awaken your senses and are followed by subtle notes of summer herbs. Bright citrus characteristics of lime along with clean minerality round out this refreshing wine. This is a dynamic food wine that is great with savory appetizers along with lighter main courses. We recommend grilled chicken, fish, Ceasar or Greek Salads, sushi and pesto based dishes. This grape variety is one of the more dynamic in the white wine world, as it is grown in so many places around the globe, and always represents its home in some unique way. In northern Michigan this variety benefits from our long, cool growing season and the mineral driven soils of this site on the Old Mission Peninsula. These cool climate "Sauv Blancs" can often be referred to as “racy”, as their acidity and leaner fruit profile can leave them drinking extra-dry – but give this wine a little time in the glass while you are slurping oysters, or lavishing in simmered mussels, and you’ll see why this style is so popular!